Cleaning and disinfection in the food industry are critical in the production process, and the efficacy of the disinfectants used is frequently debated (1). Several factors are involved in the effectiveness of a disinfectant agent. It is important to consider the number and type of microorganism present as well as the physical and chemical characteristics of the water; these factors vary from industry to industry and they determine efficacious disinfection (2). 1. To use cultures of microorganisms isolated in one's own lab instead of reference cultures. 2. To use as a diluter the water that is used daily in the factory under question. 3. To compare different disinfectant products under identical conditions of time and temperature. This methodology is useful for microorganisms that are ubiquitous in the food industry (4). 1. Trypticase Soy broth in tubes. 2. Cultures to be tested. 3. Tubes with 2.0 mL of water from the factory, to be used as diluters. 5. Petri plates with trypticase soy agar. 6. Disinfectants to be evaluated. 7. Microorganisms to be tested. Fig. 1. Scheme for the evaluation of disinfectant. 1. Prepare a series of three dilutions of the disinfectant to test for concentrations above and below those recommended by the maker, using water from the plant free of chlorine (see Note 1). 3. Prepare as many series as there are microorganisms to be evaluated. 4. Prepare a suspension from each equivalent microorganism of 5.0 x 109 microorganisms/ mL according to MacFarland's scale (see Note 2). 5. Inoculate 0.2 mL of the suspension from the microorganism into each of the dilutions. 6. Prepare four Petri dishes for each time interval (1, 2, 5, and 10 min) so that the disinfectant (at concentrations of 0.25, 0.50, and 0.75%) will be in contact with the microorganism. use plates of trypticase soy agar (if the microorganism is a bacterium) or Saboureaud agar (if the microorganism under evaluation is a mold). 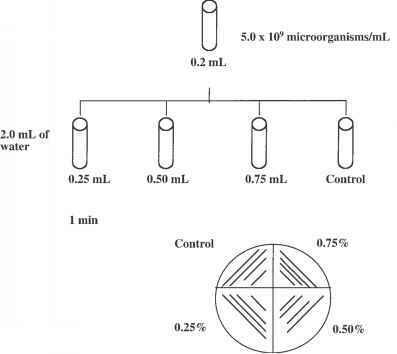 Using a gaged handle inoculate the agar by making four grooves in the surface, one for each concentration, at 1, 2, 5, and 10 min after initial inoculations of each concentration (see Fig. 1). 7. Repeat the same procedure at 2, 5, and 10 min. 8. Incubate the plates sown with bacteria at 35°C for 24-48 h and those sown with molds at 22-24°C for 3-5 d.
9. Carry out the reading comparatively with the control, considering the number of grooves that show growth and the density, on a numeric scale from 0 to 4. 10. Interpretation: The product to choose will be the one that inhibits growth at the smallest concentration in the shortest time of contact with the evaluated agent. 1. It should be free of chlorine since the residual action of chlorine can interfere with evaluation of the disinfectant being tested. 2. Prepare BaSO2 suspensions corresponding to a bacterial concentration of 5.0 x 109 bacterial count/mL. Mix 4.0 mL of 2% BaCl2 solution (v/v) + 96.0 mL of 1% H2SO4 solution (v/v). 2. Weber, G. R. and Black, L. A. 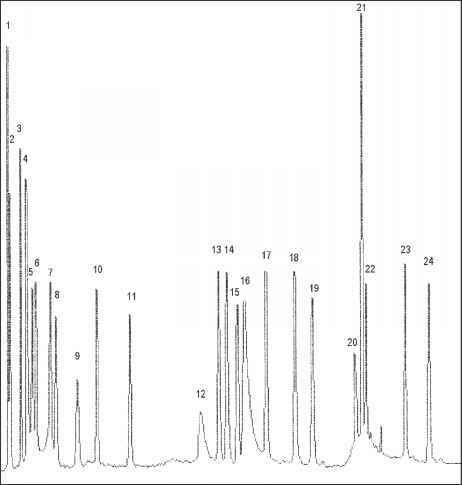 (1948) Inhibitors for neutralizing the germicidal action of quaternary ammonium compounds. Soap Sanitary Chem. 24, 137-142. 3. American Public Health Association (1978) Standard Methods for the Examination of Dairy Products, 14th ed. (Marth, E. H., ed.). Washington DC, American Public Health Association. 4. American Public Health Association (1984) Compendium of Methods for the Microbiological Examination of Foods, 2nd ed. (Speck, M. L., ed.). Compiled by the APHA Technical Commitee on Microbiological Methods for Foods. Washington DC, American Public Health Association.